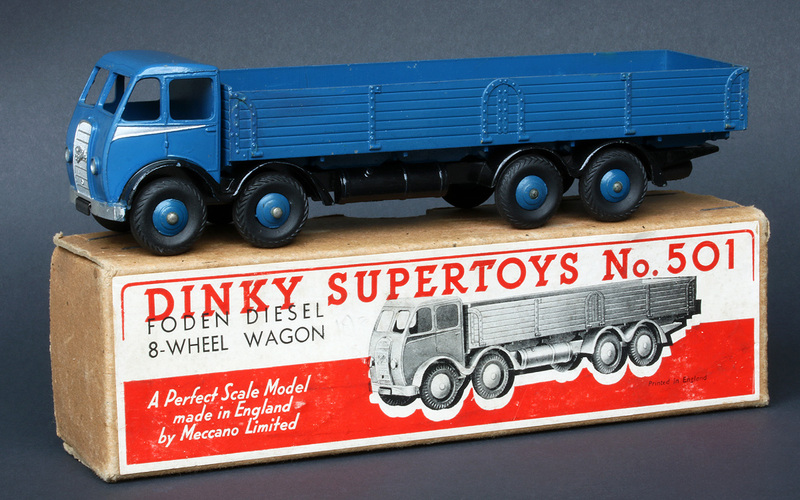 One of the very first Foden Wagons from when the Dinky Supertoys were announced in 1947. I love this particular colour of red I really think it suits this vehicle. I acquired this via the Saleroom.com from an auction house I had never previously heard of called Charterhouse from Dorset, I only had a photograph and a very brief description to go on but the model matches my expectations. It was not expensive and well worth taking a chance on. Charterhouse have proved to be very professional. It has no hook, no slots for the tank, no bosses for the chain posts, it does have a 20mph sticker and everything looks right. The box also is absolutely right with the correct colour sticker on the end, it does not have a date stamp but does have a packing stamp of IM42. It is not in perfect condition, I could see the flat tyre from the auction house photo but I love it and it looks nice on display. Here is an original half-tone Meccano illustration of the 501 Foden Wagon. The original price in 1947 was 6/11 but this shows a price of 20/- I do not know what country would have had that price. Dave--Lovely early Foden Wagon, and I also like that color very much; I think it is much more realistic than the other bright colors that Meccano chose to liven up the Foden range. We know they were marketed as toys, but most of the paint schemes are entirely unrealistic. 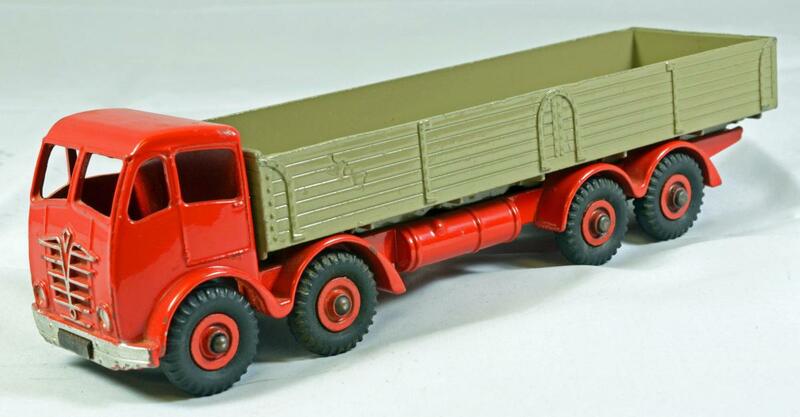 Unfortunately, I do not have the early Foden wagon in that nice brick red, but in the dark blue version. I got this, along with most of the other early Foden's, many years ago from a dealer in England. Mine is also an early version, without the tow hook, tank slots, etc. But my box is what I think was the second type used, with green tape covering both the top and bottom section. It does show the original price of 6/11 penciled in on one end, and is in quite good condition for its age. It has the stamp "JW10-9" on the very bottom. 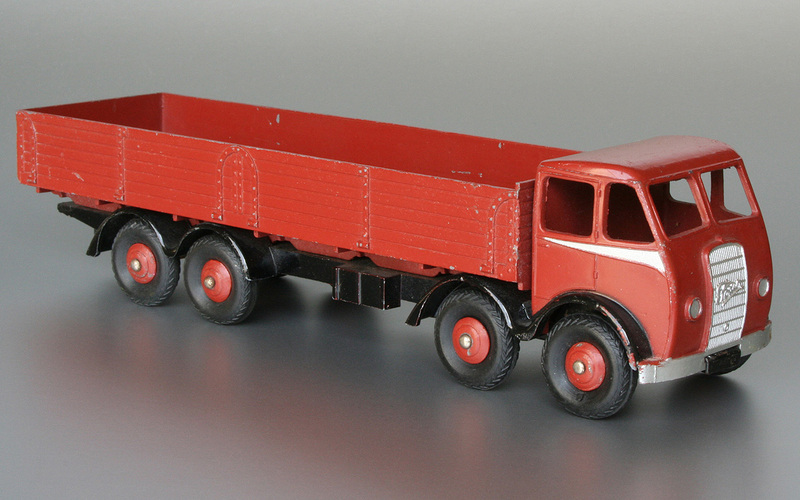 These early Foden's have a charm all their own, with their herringbone tires, and painted flashes, and clipped in axles. Different colors and grey or black tires. Also, funny to see that 2 little cuts are missing on the base plates : the front right one on the 501 and the rear right one on the 901. Hi Richard, another variation for you. Your new 901 shows a remarkably lighter grey back! My 901 has the same very slightly more fawn back as your 501 has. Which one is the "501" ? I thought that it was the Foden with grey tires ! Hi Richard, perhaps I should have said your 'supposed no. 501' and 'supposed no. 901'. If the black radial treaded tyres are original that one must be a 501. The grey tyres on your 'supposed no. 901' do not seem to be original to me, but I can be mistaken. None of my Foden have any numbers at the rear ! Yes the grey color is light but the red is darker ! All the grey tyres are marked "M" and, I think, are original. M&S Richardson wrote in their book that the grey tyres went with the first Fodens then with black ones ! 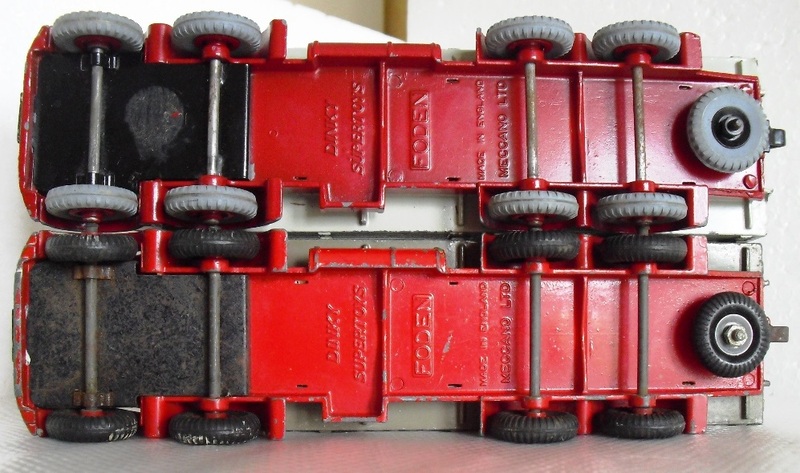 On Tuesday, November 21, 2006 Jan W. posted a photograph of the numeral “901” that is underneath a 901 Foden 8-Wheel wagon component but at the rear above the tail hook in the “Talk Model Toys” website. I see that Jan posted a similar image in Post #7 above. I have checked all my 901 Fodens with one inspected in April 1954, one in November 1954 and the other in June 1956 and none has 901 under the wagon part at the rear, in fact none have a numeral anywhere. When was the numeral added to the mould and then deleted? It must have been added earlier than April 1954 and most certainly not after June 1956 as Meccano was preparing to delete the Foden with the introduction of the Leyland in a wagon format in April 1956. Jan – Is your model still in its original box, and if so, what is its inspection data? 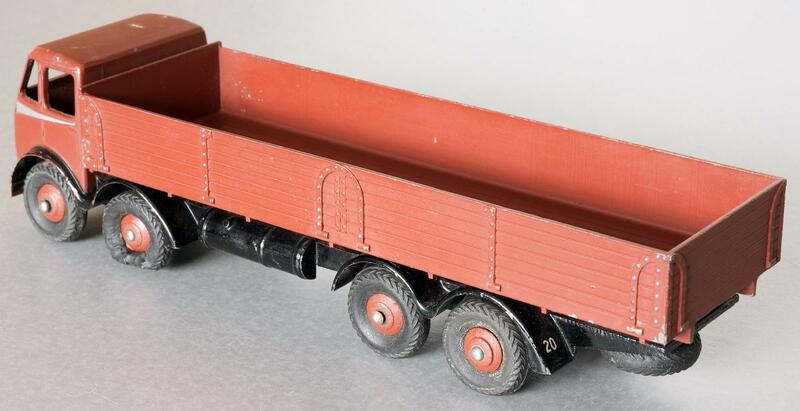 Has anyone else for that matter have such a model with 901 under the rear of the wagon part still with its original box, and if so, what are the inspection stamp details for the box? It is interesting that the 901 is absent from the February 1957 Dealer Order Form which could indicate insufficient stock being available at that time, perhaps an indication that it was on its way out with it being replaced by the 934 Leyland Octopus Wagon which utilizes the same wagon casting as the 901. However, the 901 continued being included in various price leaflets up to and including April 1957 so it can be assumed that a further and final production run was made for the 901 Foden 8-Wheel Wagon to permit this happening. 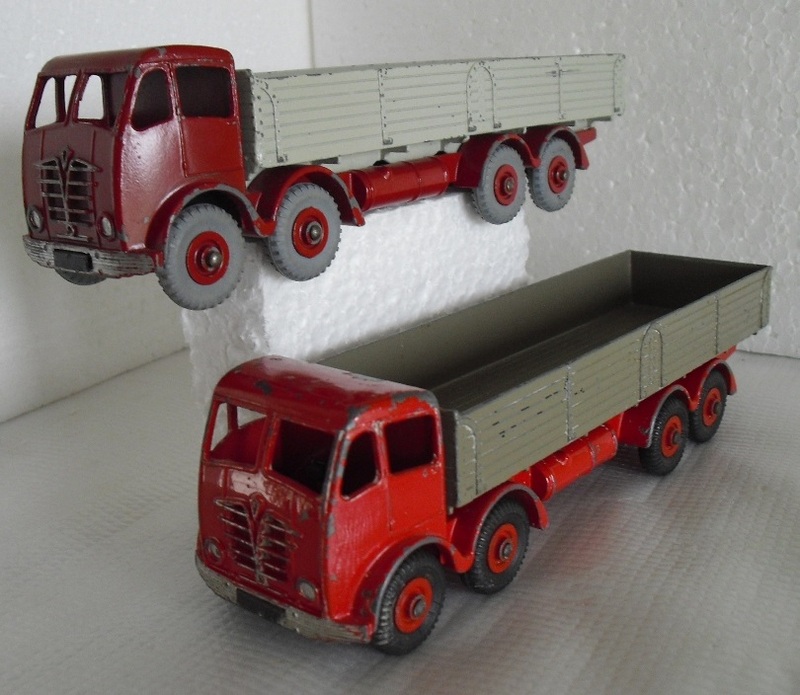 Just to throw a spanner in the works, I have recently bought a red and fawn/grey Foden 501/901 in a dual-numbered box, with the date stamp which appears to be "1 55" and a price of 7/9 pencilled on the lid. The lorry has black radial-tread tyres which appear to be original. Nothing unusual yet, but on closer inspection, the number 934 is cast under the rear of the body, where "901" is cast on Jan's example. This model has definitely not been repainted, and if the box and model are an original pairing this is very strange, since the 934 Leyland Octopus did not appear until April 1956. Even if they are a mis-match, the Leyland was never offered with the fawn/grey body. None of my other Fodens or Leylands have a number cast into the body, and the castings for each are identical, so why did Meccano feel the need to introduce, then change, then delete this feature in such a short timeframe? Strange, Kevin! To add to the mystery I checked my early 934 and it has NO number underneath at the rear. Jan, could it be that the red/fawn Octopus in the Transport Toys guide was created from a late Esso tanker chassis and Foden body? It is difficult to see whether a screw or a rivet (which you would expect on a later model) holds the two parts together. Does anyone else have models with the number 934 cast in? A quick note to say that my reasonably mint 901 does indeed have '934' cast at the rear as with your one. Sorry no box to check the date, but it i an early edition with the fine treaded wheels. Sorry my camera isn't good enough for a good photo. Picking up on Jan's extract from Gardiner and O'Neill's Transport Toys book (page 69), the red and fawn Leyland Octopus is equally suspiciaous as the 935 Octopus with chains (wrong paint pattern, wrong wheels, etc.) and the 505/1 Foden with chains blue and green. There are sevral other examples of 'made up' models in their books. John Kinchen did have a two tone blue 505/1! Jan et al-----I just checked my Foden Diesel Wagon, and it also has the 901 cast into the lower rear above the hook. I got mine new, and it is still in the original box, which is stamped 0555.....should be May, 1955. Mine also has the black block treaded tires, and is just like the one Jan showed. Hope this helps. Hi, I may have made a mistake reading the inspector's date stamp on my 501/901 box - what I took to be "M 1 55" could actually be "11 55", with a blurred mark at the front. This would make it slightly newer than Terry's "901" marked example, and closer to the release date of the 934 Leyland. Kevin----That would sure seem to make more sense as far as dates are concerned! The new acquisition of an all dark blue first type no. 501 Foden 8-Wheel Wagon is the reason for some additional pictures and observations. 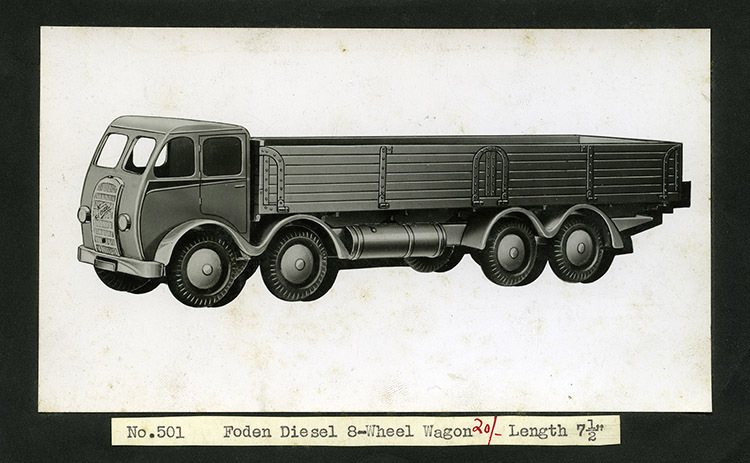 The idea for issueing this Foden Wagon must have come up very early post-war because a brass mock-up for this model (DT&MM p.248, ill.423) seems to have smooth hubs and, moreover, makes the impression to be executed on a ca. 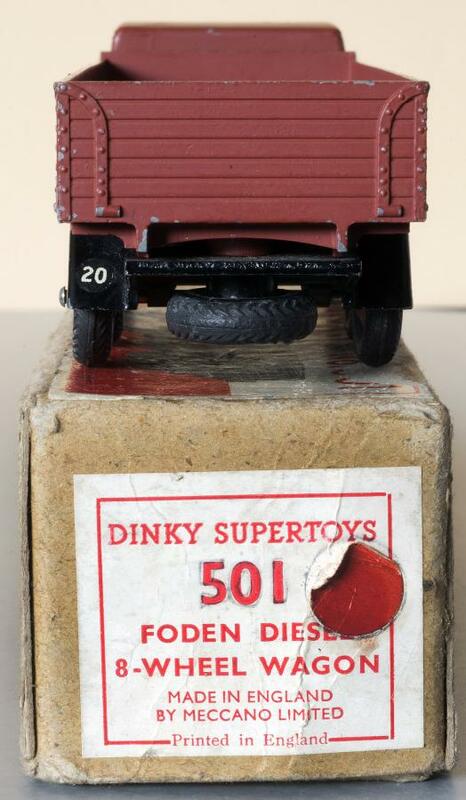 1/60 Dinky Toys scale, with the early small treaded black tyres. 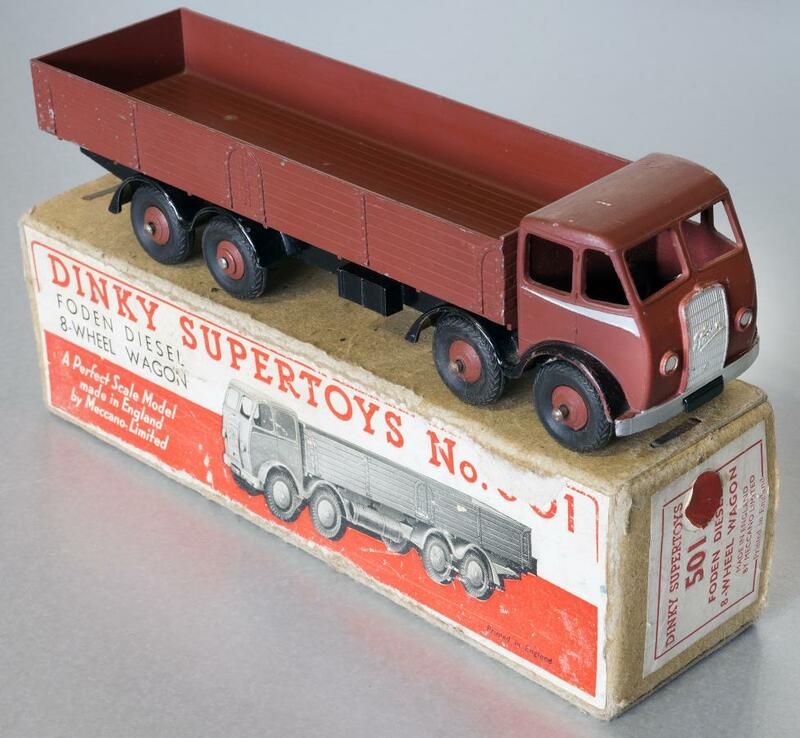 Apparently the concept for this model predates the concept of the bigger, actual 1/48 scale Dinky Supertoys. That may be the reason too that the picture on its box differs in style, is more ‘old-fashioned’ than later issues. 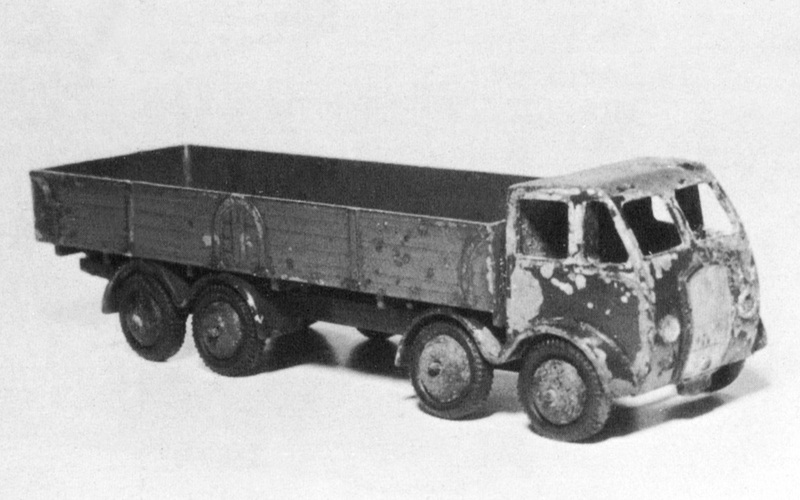 The Foden Wagon makes part of the first five Dinky Supertoys, announced in Meccano Magazine of August 1947. These eight-wheelers were all fitted with the ridged Dinky Toy hubs and 20 mm black herringbone treaded tyres. The first models to be issued featured an all black chassis, black accentuated front wings and a silver strip on both sides of the cabin. The brick red and dark blue examples here demonstrate that. The early boxes contained abundant staples, which can be very harmful to the model, if placed incorrectly inside the box. This model must be stored on its side with cabin below the only stapleless side of the underbox. Otherwise serious rubbing will be the result. Kevin, Jan, Terry and everyone else! I have enjoyed reading the exchange of comments concerning the 901 Foden with the marking of 934 under the rear of the drop-side wagon. Kevin - having looked at the quality inspection stamp for your dual numbered 901/501 Foden Diesel 8-Wheel Wagon, I must regrettably “throw a spanner in the works” in that I consider your first assumption was in fact correct, ie, M 1 55, January 1955. The second point that confirms the stamp as being January 1955 is the box itself. 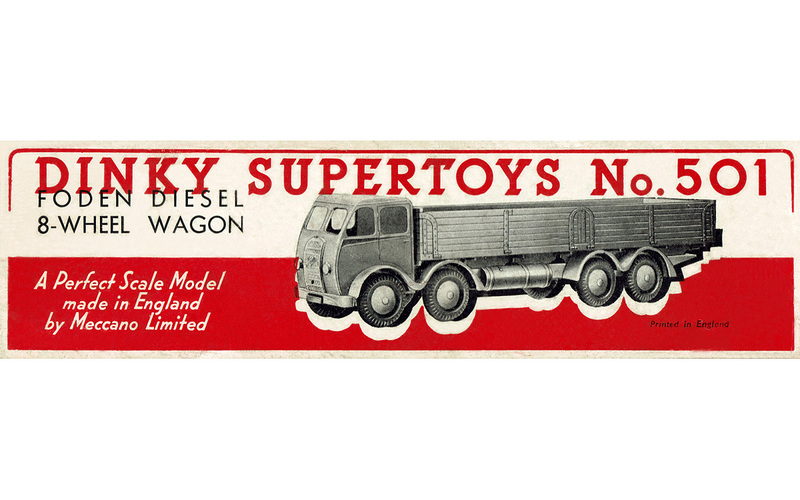 By May 1955, all Foden Diesel 8-Wheel Wagons were packaged in a DINKY SUPERTOYS box without a dual number, which apart from anything else immediately discounts the inspection stamp as being November 1955. We are all assuming that the model and box have always been together. Anything could have happened during the intervening six or so decades, when the boxed model could very well have passed through a number of hands. Basically, collectors are notorious (me included!) with up-grading the two commodities, box or model, mostly without any thought as to whether the “upgrade” actually matches reality. (I hope I am not in that category! ) In the course of a quarter of a century of research, I have seen too many boxed models that are simply unrelated and have been as a result of a collector either not knowing his hobby, or simply enjoying his hobby without any regard to accuracy. For many, a box is just a box, and if it is better than the original, who really cares. In the case of this model having “934” on the rear base of the drop-side wagon component, the initial drawings for the Leyland Octopus, in particular Job No. 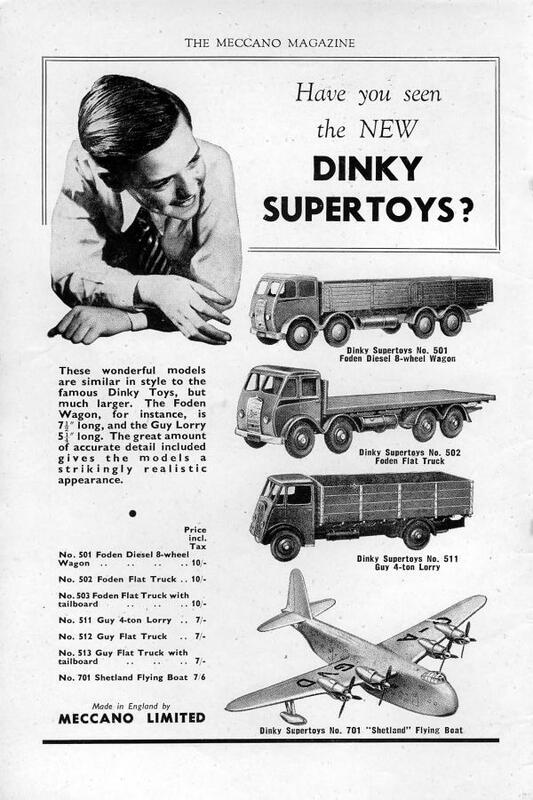 7874 were commenced on 8 June 1954, with the first changes to the drawing being effected on 21 March 1955 incorporating a change from Dinky Toys to Dinky Supertoys. (See copy of drawing below) Whether a model in a box quality stamped January 1955 would have contained a drop-side rear with 934 on it would in all probability be highly unlikely. But like everything else with Dinky Toys and Supertoys, logic may not play any part and all cards are on the table, spanner and all!! 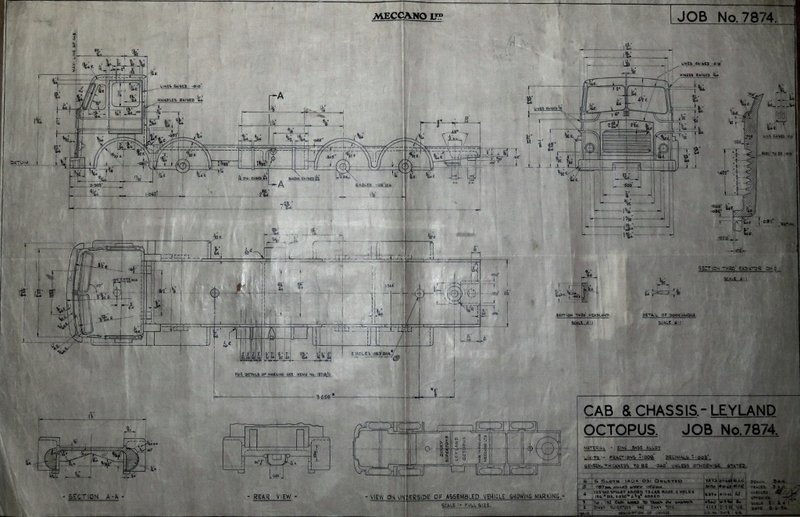 One thing stands out – why did Meccano specify “901” and “934” on the models depicted in the above Posts when the unit itself was identical to both models. Yet another Meccano Mystery of which we are left to ponder! Ron - there is nothing wrong with your camera! It is a sharp image in the area under discussion! I will be providing a link for these fascinating exchanges to the 934 Leyland Octopus Wagon Topic, as the subject does have relevance to that Topic as well. Thanks, Bruce, for your diligent research. Although we have not yet cleared up the 501/901 conundrum, at least I now know that my dual-numbered box dates from January, rather than November 1955 - I was assured by the seller that the pair had been in the family from new, and Ihave no reason to doubt his word. Hi all, as you can see from my membership number I have not yet met any club members in person. I have been collecting Dinkies for a number of years with a special interest in Fodens 1947-1964. Having now some 140 plus examples. About 90 are originals half with boxes. The rest are refurbished wrecks purchased from all types of sources. One such example from a local boot fair last summer. Having stripped many coats of house paint fron this early wagon I suspected that this was a little different when I then read the wonderful two piece artical in the journal and Rob van der Hoorts collection of MK1 and 2 Fodens. 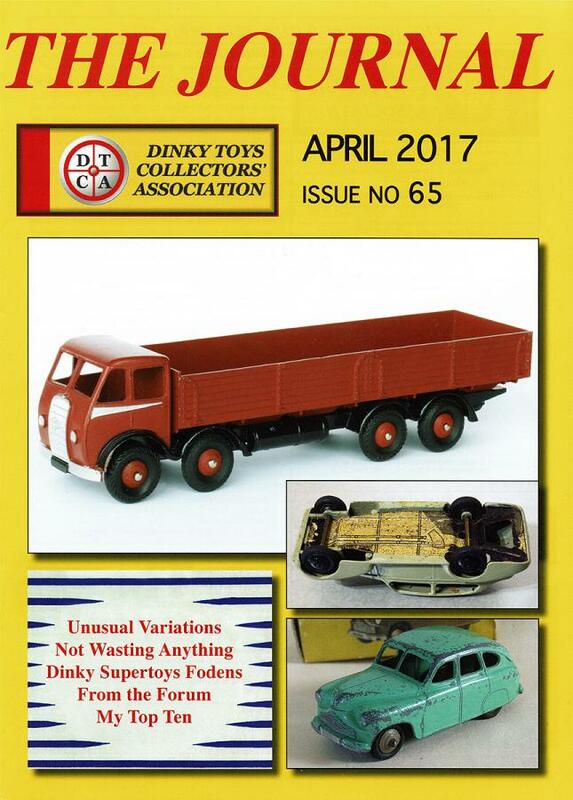 On page 13 April 2017 Journal, the top photo is of an all red MK1 wagon with red wheel hubs and black chassis. What was unusual is the body was also finished in red. I have never seen this example before and I am sure it is quite rare. Later, on re-reading Journal for July 2017 Rob shows us a picture on page eleven of his red and fawn MK2. wagon with yellow hubs. This got me sorting out my parts box and models undergoing work. It then became apparent that my boot fair purchase was the same as Robs all red MK1. example, but instead of red hubs mine has black hubs. The penny dropped. I have never seen black hubs on any kind of Foden. I have checked all my books and can find no other ever mentioned or photographed. This Foden was original under the house paint even down to an almost perfect set of nine 'herringbone tyres', no tow hook, or tank slots, even the cab plate finish was as it left the factory and even the axles looked like new with no rust. From memory, the only other model at this time that used black ridged hubs was the 39 series American saloons. Is it possible that this may have been where the black hubs came from? Have I got another mistake, can anybody help in this hunt for the truth? I'm sure with the vast pool of knowledge out there someone knows. Chris Instance. 578. I think everybody's first thought will have been 'show us the pictures', I know mine was. After all, 140 examples is quite a total and this black-wheeled anomaly is intriguing. What I lack in knowledge I make up for with enthusiasm and I'm keen to see and hear more of your collection. Thank you John. Please barewith me, I am still learning how to get on the 'Forum' as lack of knowledge of computers prevents me from showing about 600 plus photos of my collection. Son in law helps but do not see him that often. I am in the process of attempting to download a written artical onto a memery stick ( which I have done but having trouble with photos) to send to the editor for the journal about refurbishing and making good damaged pintwork. Anybody in North Kent willing to help? The main problem appears to be I take all my photos with full frame Nikon 600, macro lens and standard lens. I do not own a smart phone., in fact my emergency car phone has not even got a camera. On another issue but related to FODENS, I have just received an almost 'mint' orange and mid green MK2 502. No box but for £31. you can't have everthing. After a good clean in soapy water the chrome axles with domes at each end looked a little thinner than normal but in perfect condition. Holes in the casting are correct for these axles. It is a very early MK2 with dull paintwork, the smaller black treaded radial tyres which I have now found to be the same as 2 other models in my collection, namely both my boxed French Blue and Cherry Red 502 flatbeds. These models have the same axle ends and smaller tyres. I think I did not notice before as they are the usual dull finish with some surface rust. There is clearly a difference in the factory axles for these 1952 first issue MK2's. These axles are thickerthan MK1. type. Has anybody else notice this? or am I a bit thick! I have a very early 505 Mk2 with box wth the same early tyres, all 'Maroon' including hubs but with nomal size axles with the different ends. Help required for my gaps in knowledge please.